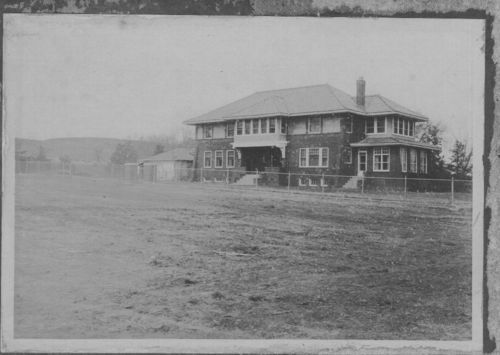 This black and white photograph shows a view of the Herman W. Avery's two-story red brick house with green Spanish tiles in Clay County, Kansas. When the Avery family first acquired the 1,000 acres of land it was used for raising Percheron draft horses, later becoming a feed and livestock operation. In 1964, the house and surrounding buildings were dismantled to make way for the Milford Reservoir on the Republican River. Some years later William H. Avery, former Governor of Kansas and son of Herman W., returned to the family farm to build a home on the remaining land.